While you expect your work jacket to do a good job of keeping you warm when the cold wind starts to bite, you might not expect it to magically release dirt and resist wrinkles. This Wrangler Men's Navy WJ40 NV Water Resistant Insulated Jacket does the trick thanks ... (see full details) (see specifications) #WRGWJ40NV. While you expect your work jacket to do a good job of keeping you warm when the cold wind starts to bite, you might not expect it to magically release dirt and resist wrinkles. This Wrangler Men's Navy WJ40 NV Water Resistant Insulated Jacket does the trick thanks to Wrangler's commitment to quality -- no magic involved! 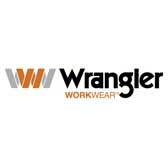 This Wrangler workwear staple goes above and beyond the call of duty. Made of 60% cotton and 40% polyester in a 7.5-ounce canvas weave, this fabric blend works together to give you a durable, water-resistant and comfortable piece of clothing. Canvas is a tightly woven fabric that’s long-wearing and does a great job of repelling water. Inside you have a fleece lining for air pockets of warmth. This is an excellent choice when Mother Nature decides not to cooperate. In addition to being incredibly long-wearing, the fabric has been treated to resist stains, so you’ll always look clean and presentable. The wrinkle-resistant polyester makes sure wrinkles and creases don’t ruin your look. You don’t have to spend time washing and ironing to look great. Speaking of looking great, a clean finish front gives this navy jacket a smooth, sleek look. Inset side pockets give you plenty of space to keep your essentials close-by for handy use. For a perfect fit, the adjustable cuff closure gives you a snug, customized fit. Like the rich, dark navy color of this water-resistant jacket? Great! The deeply saturated color will retain its hue even through repeated wash and wear. You’ll be able to get a lot done while wearing this Wrangler jacket. Full seamless underarm gussets and action elbows provide greater range of motion when stretching and bending. Double-needle stitching throughout adds stylish detailing as well as extra durability to an already incredibly strong canvas jacket. Instead of just one thread, two threads were used to create stitches that are twice as strong in this work jacket. This Wrangler jacket is perfect for any outdoor excursion on a chilly fall morning or cool spring evening. The 100% fleece lining does an excellent job of keeping your torso comfortably insulated. It's perfect for a morning walk or a cold morning on the job. You might think this Wrangler Men's Navy WJ40 NV Water Resistant Insulated Work Jacket performs like magic -- but its comfort, style, and durabiity are all real. I am really impressed with this Wranger jacket. It is ideal for doing chores in the cooler weather. I really like the insulation this jacket offers....it's not too bulky like some other jackets and it allows me to move comfortably, especially when I'm bending down constantly. The material makes this thing look brand new after wearing it all week. I highly recommend this to anyone who works outside and is constantly on the move. Wrangler Workwear Jackets: Men's Navy WJ40 NV Water Resistant Insulated Jacket is being added to your cart.